Pack 203's home is Golden View Elementary in San Ramon, and is part of Mt. Diablo Silverado District. We are an open unit and welcome any interested boys that are in 1st through 5th grade. Our program includes Pack meetings and outings, such as "Trail Trekker" hikes all around the bay area, camping trips, and special outings to points of interest. The boys are divided into Dens by grade level, and the Dens meet once a month to work on advancement and fun activities. Parents and siblings are welcome at any Pack 203 event. The Cub Scout program, also known as Pack 203, at Golden View Elementary School is affiliated with the Boy Scouts of America and has been active at Golden View since 1991. We are proud of the scouting traditions we bring to our school and to our community. A Cub Scout group is called a “Pack”, and a pack is chartered by a committee. Pack 203 is chartered by “The Parents of Pack 203” who are parents of children in Golden View Elementary. Our Cub Scout program exists because parents, like yourselves, volunteer their time and talents to support this program. 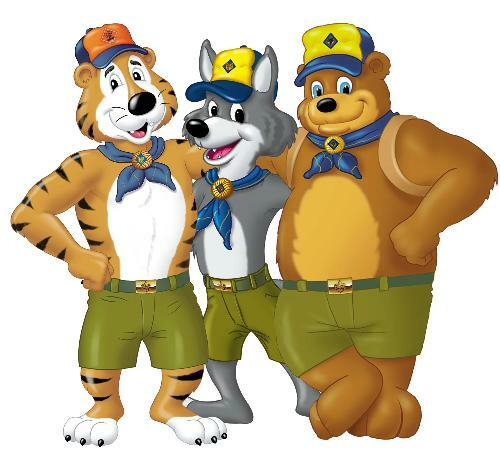 By joining the Cub Scouts at Golden View, you will help keep the scouting tradition alive and well. We are a family and home-centered program for boys 1st grade (or age 6-7) through 5th grade (or age 10-11). We strive to provide a high quality learning experience for our boys, using predefined Boy Scouts of America programs, emphasizing family, loyalty, goodwill in our schools and communities, and outdoorsmanship. We have age appropriate programs for all our Cub Scouts to help them do their best. Our goals are to teach boys core values to make good moral and ethical choices, experience and respect nature, be good citizens in their communities, and help them “bridge” over to become Boy Scouts. Our Cub Scout Pack is divided into small groups known as Dens. We arrange our Dens into age groups starting with Tigers (generally 1st grade) and advancing through Webelos II (generally 5th grade). Each Den is led by Den leaders (generally, parents who already have a boy in the Den), and the Dens meet once or twice a month to work on advancement activities that are guided by our Cub Scout handbooks. NOTE: Boys can join at any grade level. Uniforms are an important part of Cub Scouting because they help to create a sense of belonging. They symbolize character development, citizenship training, and personal fitness. Wearing the scouting uniform gives boy and adult members a sense of identification and commitment. Depending on the event, we encourage all of our boys to wear their uniform or the informal Pack 203 T-shirt during scouting activities. Once every month during the school year, all of our Dens gather together to attend a Pack Meeting. This meeting further encourages scouting by hosting families and friends of our scouts to come and join us in our Pack activities such as the Pinewood Derby, Rain Gutter Regatta, and our Blue and Gold Dinner. Some other Pack and Den activities include overnight camping, visiting local police and fire stations, hiking, creating arts and crafts, or helping out in our school or community, We also have special events during the summer, including July 4th parade, day camp, and hiking. The boys in each Den will have a full academic year to work towards advancing into the next rank. Once the boys reach Webelos II and complete their achievements, they are ready to “bridge” over to the Boy Scouts and join a local troop. We are fortunate to be able to sponsor interesting speakers and topics at our Pack meetings, such as giant reptiles, scientists, and magicians. This funding comes from our pizza booth sales at the San Ramon Art & Wind Festival every Memorial Day weekend. We also participate in the popcorn sales of Boy Scouts of America. Dues are kept reasonable due to the success of these fundraisers. In keeping with the Cub Scout theme of "Fun with a Purpose", we perform ongoing projects to help out our elementary school partner (Golden View Elementary) and participate in Scouting for Food to help the Contra Costa Food Bank. We are open to finding more ways to serve our community and to be positive role models for youth in the community. As an example, in the past on Veteran's Day, the scouts made holiday greeting cards and supplied care package items to give to Blue Star Moms for distribution to our troops.